LONDON - Datamaran - the global leader in Software as a Service (SaaS) solutions for non-financial risk management - has announced today that three of its patent applications have been published with their approval pending. Through its technology, Datamaran enables a systematic and thorough monitoring and analysis of Environmental Social Governance (ESG) risks. leading ESG and risk management experts as well as data scientists and technology professionals, these inventions protect Datamaran’s proprietary technology. “Datamaran’s technology is unique and currently has no alternatives, in my view, in the regulatory and reporting space. It systemitizes complex unstructured non-financial data with these published patent applications in an easy to digest way and enables data-driven decision making. 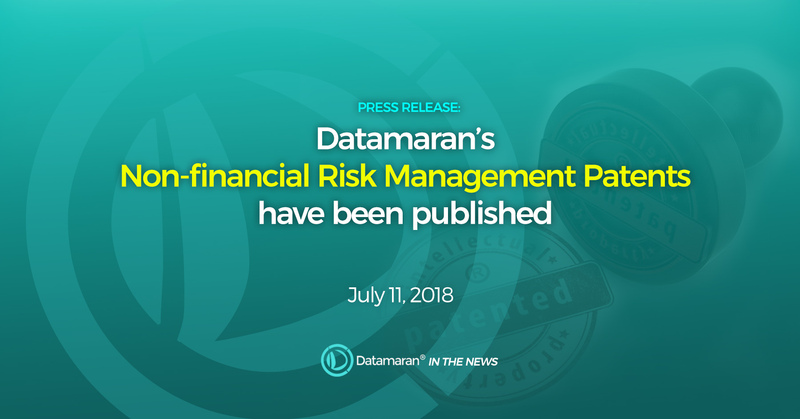 Datamaran’s approach provides a unique and a very insightful perspective into regulatory, strategic and reputational risks as well as reporting patterns. The patent publications are timely as they fit into the overall market sentiment - the World Economic Forum’s (WEF) Global Risks Report 2018 argues that four of the top five risks facing companies are non-financial. 1. “A method and system for providing business intelligence” (WO2016203229) refers to the company’s non-financial or ESG issues ontological (dictionary) framework. This invention relates to a computer-implemented method of providing business intelligence. The method includes a collection of publicly available non-financial data (unstructured “big” data) and identifying its relevance to the company through the narrative analytics. 2. “A method and systems for locating regulatory information” (WO2016203230) refers to Datamaran’s regulatory database of non-financial issues that captures both voluntary initiatives and mandatory legislation or, in other terms, soft and hard law. 3. “A method and systems for processing data using augmented natural language processing engine” (WO2016203231) refers to Datamaran’s systemic approach to issues-centric analysis across sources. The patent relates to a NLP technique of processing data that includes issues analysis from multiple perspectives and categorizing them into strategic, regulatory and reputational risks and opportunities. For any press enquiries please contact Saskia Ligteringen at saskia@datamaran.com or on +44 2077029595. Datamaran is the global leader in Software as a Service (SaaS) solutions for non-financial risk management. The team is composed of ESG and risk management experts as well as data scientists and technology professionals. Datamaran’s proprietary software enables data-driven decision-making. The company captures evidence-based insights for more than 7,000 companies and tracks all regulatory initiatives worldwide. Datamaran’s AI sifts and analyzes extensively publicly available sources such as corporate reporting, regulations, news and social media. Datamaran’s global clientele of blue-chip companies have replaced the dated and expensive manual processes used for benchmarking, materiality and risk analysis as well as issues monitoring. The insights customers gather are used across multiple business teams (governance, risk, compliance, sustainability) to identify and monitor risks and opportunities and to inform corporate strategy. Datamaran is a well-known and trusted partner of established advisory firms that use the service to augment their consulting offerings.